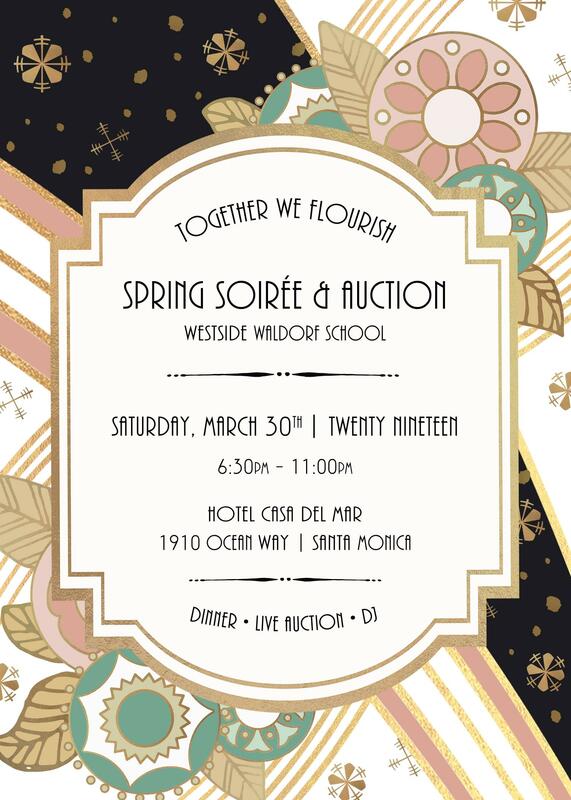 We will celebrate our dedicated teachers, wonderful students, and connected community by gathering at the Hotel Casa Del Mar in Santa Monica on March 30th to raise significant funds for our school. We hope to see everyone there, including extended families, friends, and alumni. 1) Enhance a Community Themed Project (Grades families) or Early Childhood Basket (EC families). 2) Donate an item to the Online Auction by February 28th. 3) Purchase your tickets (on sale March 1st) and attend the Spring Soirée & Auction. Here is your chance to get crafty and creative! Projects and Baskets will be up for bid during the silent or live auction on March 30th. This year we are happy to introduce Themed Community Projects as a way for grades parents to participate, in place of the class-based projects. 1) Each Project will need one or two leaders to coordinate and curate the project components, as well as install and display the project for auction on the morning of March 30th. 2) Design each theme to raise at least $1,000. 3) Projects and components are ideally as collaborative as possible. Please keep student artwork anonymous. Bidders are encouraged to purchase items because of the item itself, and not the artist. All grades parents should sign up for a theme that can be class or multi-grade driven. Any questions? Contact auction@wswaldorf.org to help guide you with creating a class theme. Or if you'd like to work with families from different grades and there's an established theme that resonates with you, click here to contribute to a Themed Project. There will be 3 Early Childhood Baskets -- one created by McComb Nurseries, another by McComb Kindergartens, and the third by all classes on 15th Street. Early Childhood parents, please talk to your teacher about your class theme and ways to contribute. Our online auction goes LIVE on MARCH 1st! We are collecting donations now. Please donate by February 28th. Don’t be afraid to ASK your friends, families, neighbors and business colleagues for donations. Think deep and wide of all the people you know with vacation homes they can loan; access to sporting, concert and theatre tickets and movie premieres and VIP parties; subscription services, and your favorite spa or restaurant gift cards. To donate items to the online auction, click here. Buy Tickets: Advance ticket sales begin March 1st! These are a series of parties hosted year-round by parents for parents/families. WWS parents host and cover the expenses of their party. WWS families pay to attend the parties with 100% of the proceeds going to WWS Tuition Assistance. The goal is to build community and have fun while also fundraising for the school. It's fun to co-host so we encourage it! We are currently planning our 2019-20 season. Contact Mariana Ramirez or Charleen Kay at auction@wswaldorf.org for guidance through the process. If you need event ideas, we have a lot of suggestions. This year we are offering sponsorship opportunities in our Spring Soirée & Auction program and online promotion for businesses who wish to support our mission and market to our community. Please talk to us if you know of a business who would like to sponsor this event!